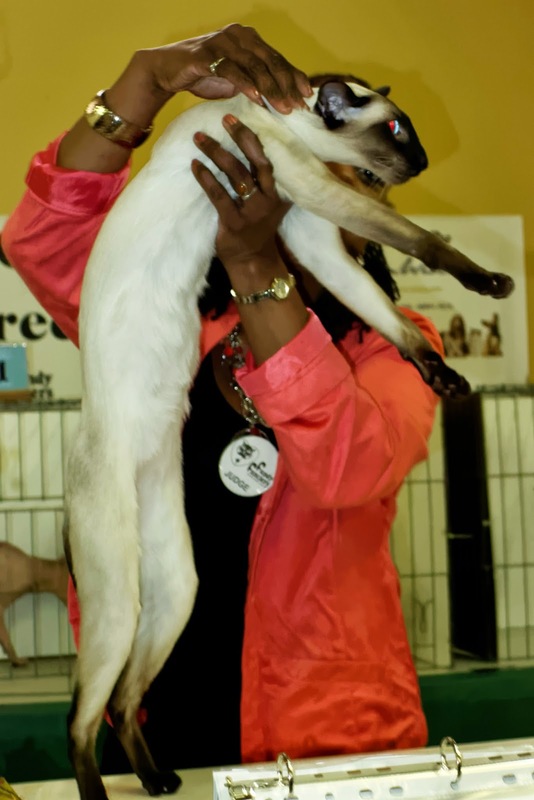 We went to another cat show yesterday, and sad to say, this was the worst one ever, and I don't just mean photographically. This time, the judging stations had absolutely no lighting, making proper viewing, and picture taking without flash impossible. I went in with the EOS 5D but within 5 minutes, I was right back out again to put that camera back in the car. Because I carry the Lumix DMC-LX5 in my shirt pocket everywhere, I used it to manage just a few pictures, with flash. For me, using flash at a cat show has it's issues. 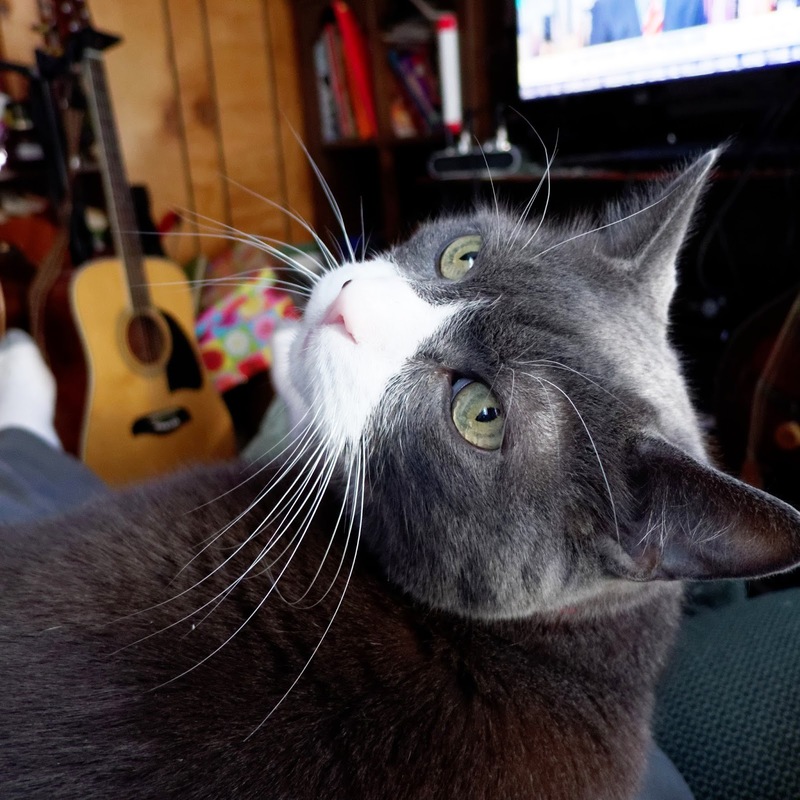 Although it doesn't seem to bother the cats when a lot of other people are happily flashing away, I'm certain with the super sensitive eyes which these noble creatures posses, it must bother them, or maybe even create long term harm, over time. It's never been an issue before, because in past shows, every judging station had good florescent lighting across the top of the display windows. But not at this show. Also, as you can see, it's rather hard to control shadows and red-eye with a compact camera flash. If this is some kind of energy saving , or budgetary thing, somebody should let the show organizers know about the latest in LCD lighting technology. I am not very well equipped when it comes to flash. I do have a little Canon 270 EX II for the 5D, and I should get a bounce-diffuser I suppose, if they sell such a thing small enough to fit - that might have saved my bacon yesterday. Needless to say, I wasn't expecting this degree of blackout at the judging windows. Even here, with the aperture wide open (f2.0), although the background may be out of focus, is's far from being true "Bokeh". Again, the cost of convenience - we simply have to accept there are certain things that only a DSLR can do. Back to the cat show - I noticed another disturbing trend - vendors that have nothing to do with cats were set up throughout the room, doing nothing but taking up valuable space, and breathable air, leaving very little room for the actual cat judging stations, nor even to leave decent space around the participants and their felines. When I go to cat shows, the last thing I want to see is the "Watkins Man", and one so called vendor even had a yard sale going on! If this is what it has come to, count me out from now on - the best cat show for me is always the one going on every day and night inside our house.